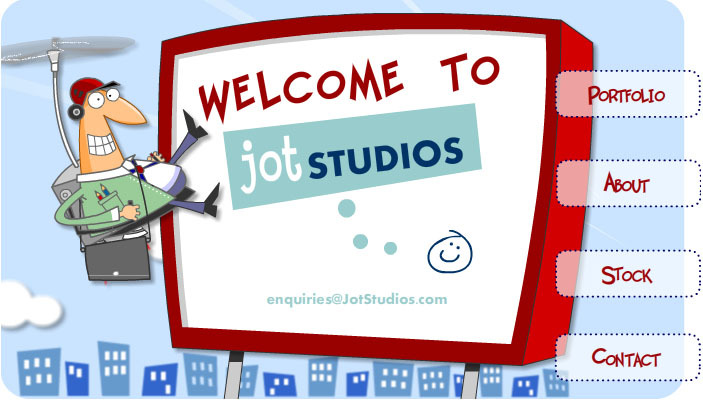 JOT Studios - Cartoons, Cartoon Flash Animations and Illustrations. The home of freelance cartoonist, illustrator and Flash animator John A Abbott. Cartoonist wanted? Stock Cartoons available. Cards, Websites, Banner Ads, Corporate Literature, Training Courses, T-Shirts, E-cards and more with clients worldwide. View our portfolio, learn about us or contact us! We'd love to create something for you! Want a cartoon logo or character design for your business ? JotLogos and JotCartoons are launching soon !